Wouldn't it be helpful to know what your students' ideas are about a science concept before launching into a new lesson or unit? 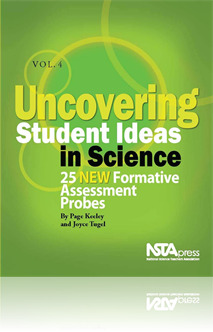 Uncovering Student Ideas in Science, Volume 4, offers 25 more formative assessment probes to help reveal students' preconceptions of fundamental concepts in science, bringing the total to 100 probes for the popular series by author Page Keeley. Teachers of grades K-12 will find short probes with grade-band specifics that provide easy-to-follow suggestions for addressing students' ideas by promoting learning through conceptual-change instruction. Volume 4 adds to the probes in physical, life, and Earth and space science with a new category called "unifying principles." Also covered is a discussion on balancing formative assessment with summative assessment. 5 Another Great Book from Keeley! This book is full of more formative assessment probes for life science! I love using these to uncover my students' background knowledge and misconceptions at the beginning of each unit. They are easy to use and do not need to be modified like many other resources.